Noise Rock, Art Terror, And Wild Dogs: 35 Years Of Brooklyn's BC Studio - Kerrang! Brooklyn (/ˈbrʊklᵻn/) is the most populous of New York City's five boroughs, with a Census-estimated 2,636,735 residents in 2015. 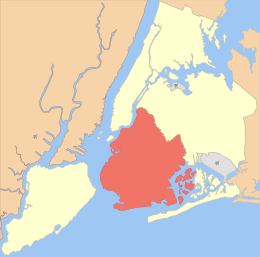 It borders the borough of Queens at the southwestern end of Long Island. 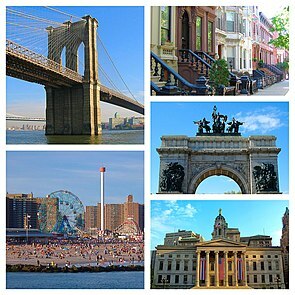 Since 1896, Brooklyn has had the same boundaries as Kings County, the most populous county in the U.S. state of New York, and the second-most densely populated county in the United States, after the county of New York (which is coextensive with the borough of Manhattan). With a land area of 71 square miles (180 km) and water area of 26 square miles (67 km), Kings County is New York's fourth-smallest county by land area and third-smallest by total area, though it is the second-largest among the city's five boroughs. Today, if it was a separate city, Brooklyn would rank as the fourth-most populous city in the U.S., behind the other bouroghs of New York City, Los Angeles and Chicago. Brooklyn was an independent incorporated city (and previously an authorized village and town within the provisions of the New York State Constitution) until January 1, 1898, when, after a long political campaign and public relations battle during the 1890s, according to the new Municipal Charter of "Greater New York", Brooklyn was consolidated with the other cities, boroughs, and counties to form the modern "City of New York" surrounding the Upper New York Bay with five constituent boroughs. The borough continues, however, to maintain a distinct culture. Many Brooklyn neighborhoods are ethnic enclaves. Brooklyn's official motto, displayed on the Borough seal and flag, is Eendraght Maeckt Maght which translates from early modern Dutch as "Unity makes strength".